Sorry the weekend update was a little delayed this week. I've been a busy bee (more details to come in a couple days). I would also like to give a shout out to my parents who finally got power back today. They were some of the lucky ones, and my heart goes out to all the folks in Alabama affected by the recent storms. Once it got a little chilly in the courtyard, the gang stuck it out under the heaters. It's not quite summer yet :( But I'm not complaining! At least it is bearable to be outdoors for part of the day. The one downside of Queens is that it is a little out of the way. After the beer garden, we wanted to go somewhere in Greenpoint. I'm the only loser that doesn't ride my bike to work which made getting from point A to B a little tricky. Christian volunteered to ride on the panier rack of Kurt's bike and let me use his bike. I was terrified of falling off the whole time because you lean much farther forward than on my bike, but Christian was a champ and rode side saddle all the way to t.b.d. Thankfully, I was able to ride in the safety of the G train home. Saturday morning, I got to peek in on one of Kurt's projects under construction in Brooklyn. His firm designed a large rooftop space for an apartment building on Dean Street in Prospect Heights (Common and Serena Williams supposedly live there!). There are some amazing views of Brooklyn from the roof and a up-close and personal vantage point of the new Atlantic Yards stadium which is currently under construction. 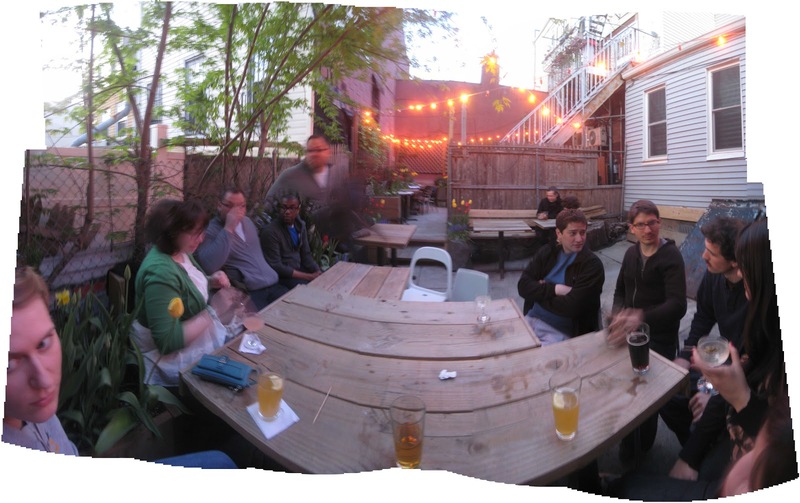 Saturday evening, we met up with some friends at a bar near Kurt's apartment called Quarter. They are well known for their signature cocktails and have a great outdoor space which was perfect for the lovely day. Somehow we always end up with a large group, so we pulled a few tables together and proceeded to play a few rounds of Catch Phrase (as per usual). Some bars that don't serve food are nice enough to let you order in, so we got a few pizzas from down the street and hung out until the backyard closed. After Quarter, we took a quick detour to Korzo and Kurt convinced the bartender/kitchen to serve him a bowlful of coleslaw. It is one of his many obsessions. Kurt and I also took care of some projects in his room over the weekend. For obvious safety reasons, Kurt wanted to relocate his bikes from hanging on the ceiling above his bed to a corner mounted on the wall. 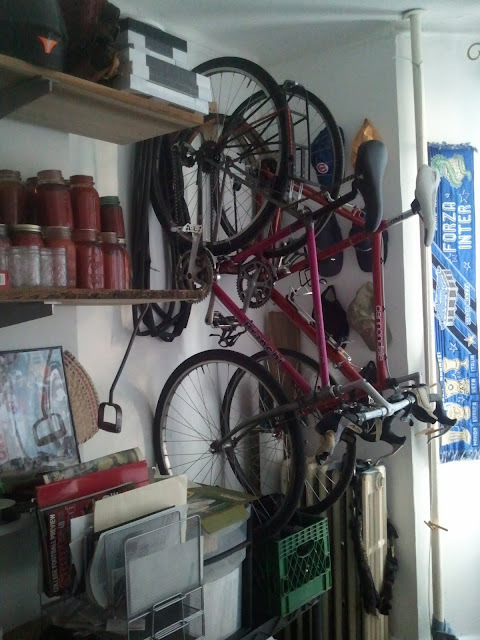 After a trip to the bike shop, we decided a fancy hook meant for holding a bicycle on the wall was unnecessary. We rigged something up with hooks Kurt already had and some scrap wood....and a few prayers. I'm not sure we really hit any studs, but apparently it hasn't fallen yet. We added a few extra screws for good measure. I'm still a little wary. We were on a DIY roll and Kurt's skis were begging to be hung on the wall too. After some online perusing of racks, we decided to make our own using the same principle as this model. Look at that pride! We used some more scrap wood from Kurt's backyard (we were going for the rustic, ski lodge look) and put this beauty together. Check out those concealed connections! That is what I am most proud of :) I think it turned out great. If you are in need of a Martig/Graveline ski rack, please send your orders our way! Phew! Is it the weekend again yet?! Christian was a great passenger...not such a good tipper though.